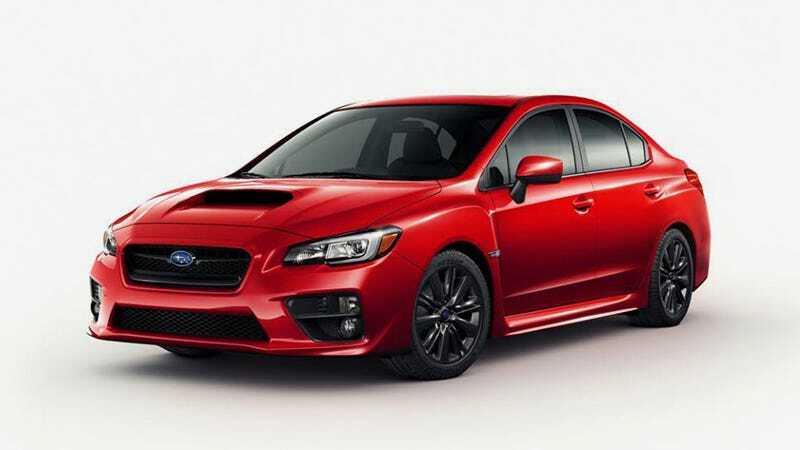 No matter how hard Subaru has tried to keep the 2015 WRX under wraps, they just can't. First a front end shot leaked, then its CVT transmission. Now, we know how powerful it is, how quick it gets to 60, and what it looks like from behind. A scan of Car and Driver's upcoming feature on the WRX leaked on WRXforums.com (head over there to see the whole CandD feature and pics), and it shows everything else we've been missing about Subaru's new rally monster. The 2.0 liter engine is similar to what we see in the BRZ, but is turbocharged and has direct injection (the BRZ has port and direct injection). It puts out 268 horsepower, which is just three more than the last 2.5 liter WRX had, but the power arrives earlier in the band. That equals a 5.4 second sprint to 60 in the six speed manual and 5.9 in the CVT. Yep, CVT wasn't a lie, it's true. There is a "sport sharp" setting for the CVT, which makes the CVT act like it has eight gears. Don't buy the CVT. Just don't. Thanks. As we thought, there will be no hatchback offered, just the sedan. There is electric steering with a quicker rack, and the car has been stiffened precipitously. We'll see the car next week at the LA Show, probably.